The new aircraft carrier, HMS Queen Elizabeth is to be officially named by the Queen today at Rosyth dockyard. The Queen is set to name the vessel with a bottle of malt whisky, instead of champagne, amid a carefully choreographed and stage-managed show of military might. It is the biggest warship the UK has ever built and the costs of the project have so far over-run by £2.3 Billion pounds. This was supposed to be the first of a new generation of aircraft carriers but the second ship, to be named HMS Prince of Wales faces an uncertain future. It is understood that the aircraft which will eventually be launched from the carriers, the Lockheed F-35B Jump-Jet will not participate in the ceremony after an engine fire delayed their dispatch to the UK. The ceremony will also be attended by UK Prime Minister David Cameron and Scottish First Minister Alex Salmond in what is sure to be a politically charged encounter with the referendum just around the corner. 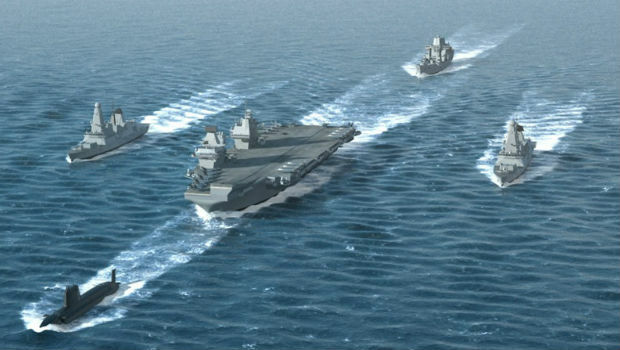 Cameron will be keen to claim credit for a wonderful ship and will be keen to stress the “military strength” angle. Salmond will likely give high praise to the workers at Rosyth Dockyard whilst noting the cost over-runs and questioning the need for such profligate spending during a time of austerity. Now that this contract has come to an end, there are renewed fears for jobs at Rosyth. One of the constant claims from the No campaign in the referendum is that a Yes vote would see job losses at Rosyth. With this in mind, we asked the Secretary of State for Scotland, Alistair Carmichael MP for a guarantee that if there was a No vote in the referendum, Rosyth would still be open in ten years. None was forthcoming.